New graphics technology provides unrivalled accuracy, resolution, detail, performance and sensation of speed. Blistering speed. Relentless rivalry. 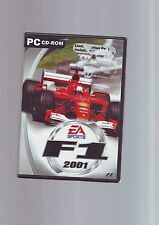 F1 2001 Limited edition with F1 Manager Pc Cd-Rom. SimCity Deluxe. Great condition works perfectly, manual and box all good condition. The Sims 3 Showtime Expansion Pack PC Dvd MAC. Condition is Good. Dispatched with Royal Mail 2nd Class Large Letter. In a chain of events, Alaska declared independence, and major powers of the world began fighting over its oil-rich territory. 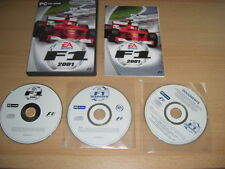 In original jewel case with inserts and install guide (electronic manual). This is a special edition release of Need for Speed II which provides improved visuals in comparison to the original release. Need for Speed II: SE for PC CD-ROM and compatible with Windows 95 / 98. RUNS ON WINDOWS DOS. You are the star. Heart of the Tiger. By EA 1994. BIG BOX EDITION. Here I have for sale a new PC CD-ROM of Command and Conquer Generals disc 1 & 2, zero hour disc 1 & 2. Please see the pictures as they form part of the description. Serial numbers on the back of both discs 1. Comes supplied in clear plastic wallets. Why not check out my other items for sale. CD is in full working order. • DVD style case. Very Good (VG) More than one or two slight defects. Still in collectible condition. As seen in the pictures above. As the saying goes. PERSONAL COLLECTION is not an option due to personal circumstances, sorry. Little Big Adventure. BIG BOX EDITION. Complete with manual and install key code. In good to very good overall condition. Spore Creature Creator for PC DVD-ROM and compatible with Windows XP / Vista / Win 7. The player starts with a colored blob. This blob has a spine in it through which it can be modified in both in form and size. 3 pc games on one disc. Got no case but will send in a plain case so stays in good condition. • Quick start guide. 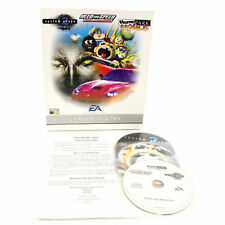 EA Compilation for PC CD-ROM and compatible with Windows 95 / 98. Very Good (VG) More than one or two slight defects. Still in collectible condition. • System Shock 2. • Original box. Atomic Bomberman (PC: Windows, 1997) . Condition is Very Good. Dispatched with Royal Mail 1st Class Large Letter. PC DVD-ROM Game - Command & Conquer 3 Tiberium Wars Kane Edition Condition is Good. Dispatched with Royal Mail 1st Class Large Letter. Note Requires the Original Sim City 4 to Load and Play! SIM CITY 4. Your City is on the Move! After winning the cup once, there are still more cards to be collected by playing and winning as different teams. Quidditch World Cup alleviates this problem with the “golden snitch bar”. Useful Links. We cannot accept responsibility for parcels that get lost on the way to us. Our service is 100% served with a smile. Your invoice number. It was released in 1998 and was the successor to NHL 98. F1 Manager. Runs on Windows. By EA 2001. Includes Original Manual.